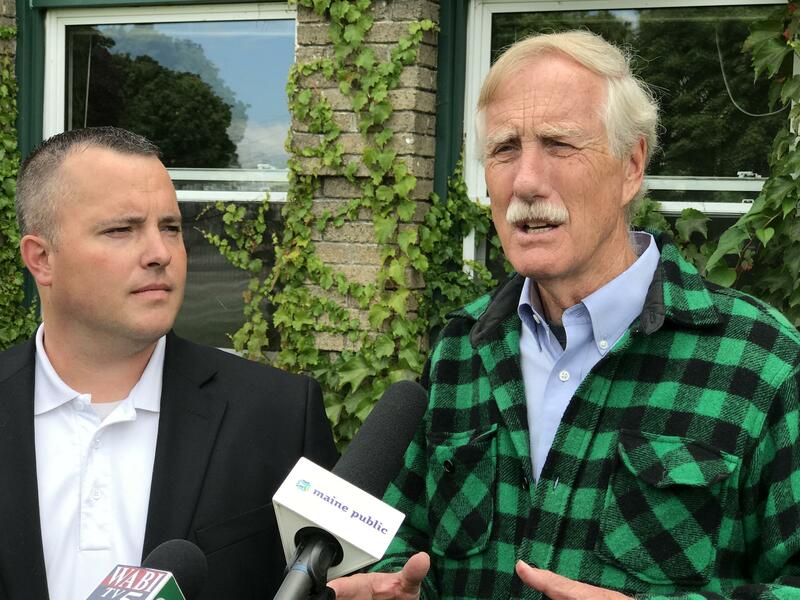 Sen. King speaks with reporters in Millinocket while Our Katahdin's Mike Seile looks on. AJ Higgins reports on Senator King's tour of Millinocket. Walking with the aid of a hand-held floodlight through the darkened interior of a cavernous building that once housed paper-making machines for Great Northern Paper, Sen. Angus King is trying to see the future. The gargantuan paper mills that once employed hundreds of residents are not likely to return here to Millinocket, but a new generation of entrepreneurs such as Mike Seile would like King to know that the GNP complex has potential. “There are alternative potential uses, whether it’s pellet manufacturing, bio-diesel, those are all options for this building – depending on the scale,” Seile said. Here in the shadow of Mount Katahdin, policy decisions from the Trump administration could affect Millinocket in a very direct way. Later this month, a decision will be made by Secretary of the Interior Ryan Zinke who will determine whether the nearby 87,000 acres of forestland designated as a national monument by the Obama administration will keep that status. In addition, new tariffs on Canadian spruce and fir coming into Maine could also have an impact on the development of forest products industries at the former mill site. Both issues are front and center for Mike Seile, the vice-president of “Our Katahdin,” an organization that supports redeveloping the former Great Northern Paper mill site into a world-class bio-industrial park. King says the region would do well to diversify its economic drivers. And while it's empty and lifeless now, King says the former GNP facility has enormous potential. And while Washington may have a big influence on issues that affect the region, some locals believe that the Katahdin region has the power to revitalize itself. Peggy Daigle, one of the area residents accompanying King on his tour, is a former town manager. She believes home-grown marketing efforts to attract tourism, business and jobs to the region will have more positive impact than some government initiative. After completing his tour of the Millinocket area, King traveled on to Lincoln for an economic development forum. This story was originally published Aug. 8, 2017 at 4:41 p.m. ET.